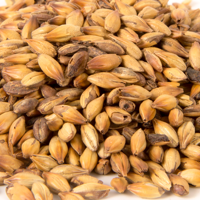 Very special Belgian dark malt, obtained through specific double roasting process. Is used to produce a deep red to dark brown-black colour and fuller body. Unique flavour and aroma. Gives much colour and raisin-like flavour. Imparts a rich malty taste and a hint of nut and plum flavour. May substitute Chocolate and Black malt if bitterness is not desired. Abbey ales, dubbels, porters, brown ales, doppelbocks. Up to 10% of the mix.